This is the home console that saved the video game market and got it rolling again. When Nintendo emerged on the scene with this 8-bit NES, the video game industry was in dire straits after nearly flat-lining in the crash of 1983. The original console wars between ATARI, Coleco and Intellivision ended in all three companies hitting very hard times. Nintendo leveraged their new product not simply as “a video game system,” but rather as a well rounded (family oriented) “Entertainment System,” in hopes that this creative marketing would aid them in recapturing lost ground in the home console-gaming market. I personally couldn’t have cared less how they marketed it, as my intentions were more selfish-oriented (I didn’t plan on sharing my Nintendo). The NES was a colossal hit and would reign supreme for nearly a decade until the SEGA Genesis arrived. With its massive library of games including the Mario World series, the Zelda series, Metroid, Tetris and countless others this system is mandatory for any collector. Here it is, the NES! 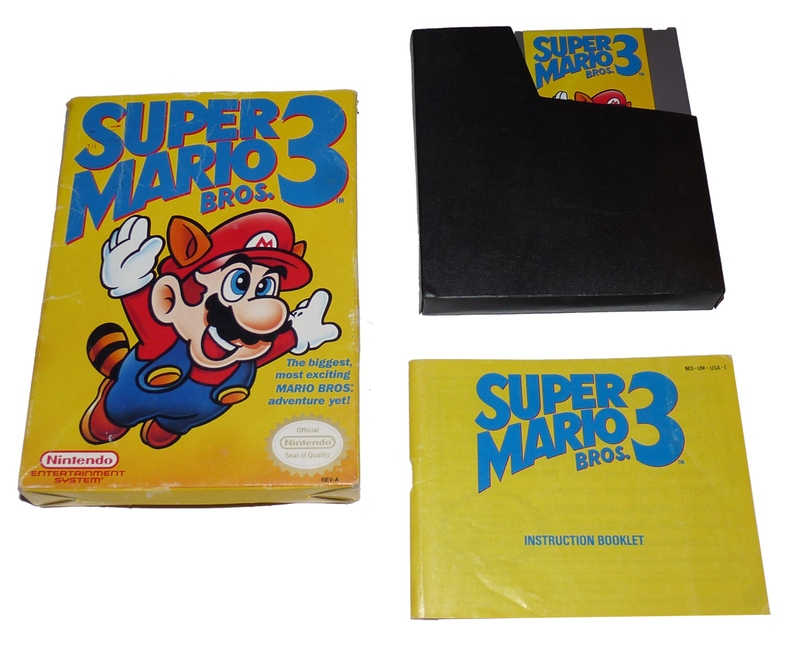 This baby came with the pack-in game Super Mario Bros (with many pack-in variations thereafter). What distinguished the model 1, affectionately nicknamed the “toaster,” from other game consoles of the time was the unique front-loading mechanism it employed. The now infamous “Zero insertion force” (ZIF) cartridge socket, which ironically had many of us “forcing our carts in,” in all kinds of unique ways just to get the games to load. It was orphaned in 1993 due to countless hardware failures of the 72 pin socket. 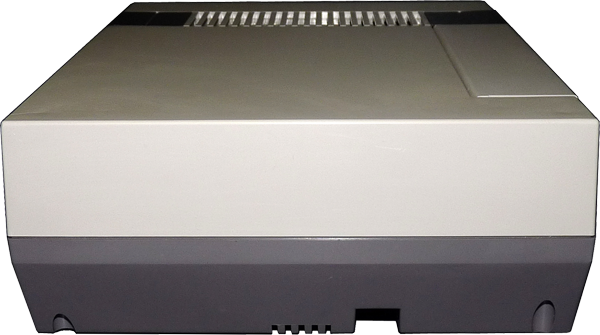 The NES model 1 bore a simple color scheme, with 2 shades of gray, with black trim, sheathed over a prominently rectangular 8 x 10 x 3.5 inch shell. 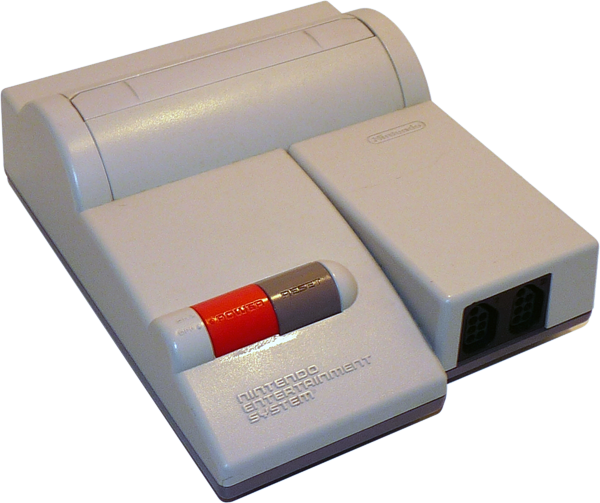 The cartridge slot, covered by a small hinged door, bears the brand “Nintendo Entertainment System” in red across the front of the system. On the front of the NES you have the Power button and its red LED light. Next to that is a Reset button which will restart the game. Above these buttons you have the cartridge bay. You lift the door open, slide the cart in face up until it locks in place and then press it down into the machine and close the door. The 72-pin connector that the cartridge inserts into became an issue rather quickly. When you insert a game you will sometimes get a solid color on the screen or see the game with chunks of graphics missing. To fix this you would take the cart and blow on the blade at the bottom of the game and then insert it into the machine. Basically the moisture from your breath would help make the connection between the cartridge blade and the 72-pin connector inside. Odd I know, but you do what you have to do! Fortunately this is now an easy fix as you can buy new connectors easily online and they are easy to install. Finally, on the right side of the NES in the black strip, are the two controller ports. The left of the Nintendo Entertainment System is free of any ports. The right side has two RCA ports, one red and one yellow. The red RCA is the audio out and the yellow is video out. On the back of the NES you have three ports. The AC Adapter/Power port used with the NES-002 Power Supply is on the left and next to it is a RF Coaxial out port used with the NES-003 RF box. Next to that is the Channel selector switch used with the RF Box. The NES does not output stereo sound regardless of the connection method you use. For detailed instructions on hooking this bad boy up visit our HOW TO section. The NES has held up pretty well over time. Other than the 72-pin connector issue the only other problem that I ran into with the Nintendo Entertainment System is one that is shared with the Super Nintendo and that is the plastic grey case. Both systems have a bad problem of yellowing or becoming discolored over time. With all the units I have had over them years it seems about 50%+ have varying degrees of discoloration, some more severe than other and some are very bad. I think the SNES suffers from this a little more than the NES. But as long as it works who cares! 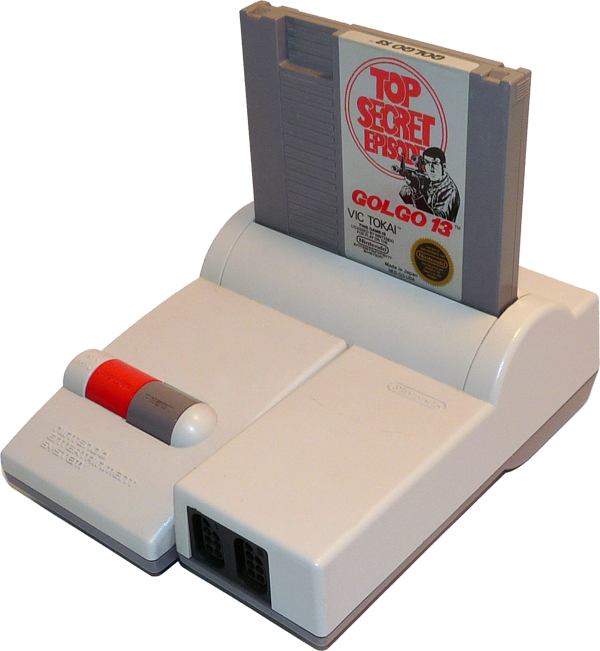 The model 2 NES known as the “Top Loader”, was a re-release in 1993 of a more affordable NES after the SNES was released. 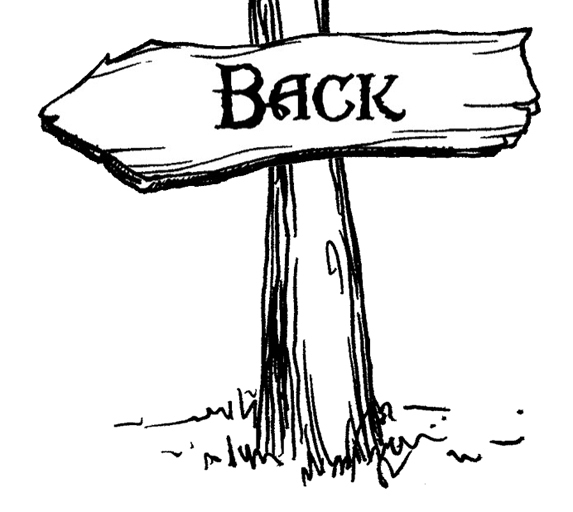 It has both similarities and distinct differences from the original version. The shell was reduced to a mere 7.5 x 6 inches, being easily lost in the model 1’s shadow. It bore the classic color scheme, with the upper shell being light grey while the underside contrasted a much darker hue. It also sported a red cylindrical sliding power switch instead of the original boxy push-button. In this version the LED power indicator was removed, and the cartridge port reverted to the industry standard top loading format which does make connections more reliable. The trade-off, however, was that the NES 2 offered only RF outputs instead of the RF and RCA cable offered on the original, thus delivering poorer quality sound and visuals to the consumer. That reason alone makes this version less desirable than the original model. The Power switch and Reset buttons are on the top left of the machine and the two controller ports are on the right. With the RCA ports removed the only connection option is located on the back. You have the AC Adaptor/Power Supply port, the RF Switch coaxial port and a channel selector switch. 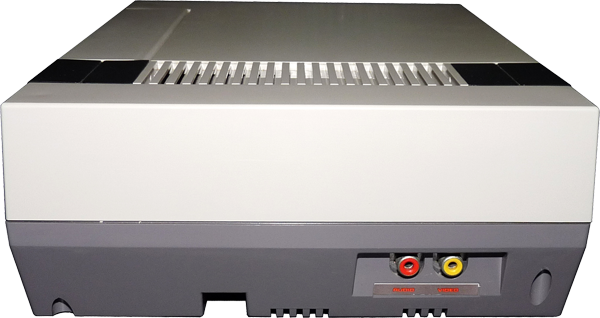 The NES 2 uses the same NES-002 Power Supply as the original NES. The controller was also redesigned (see below) and is an improvement if you ask me. Referred to as the “Dog Bone” controller for obvious reasons, it is shaped similar to the SNES controller. 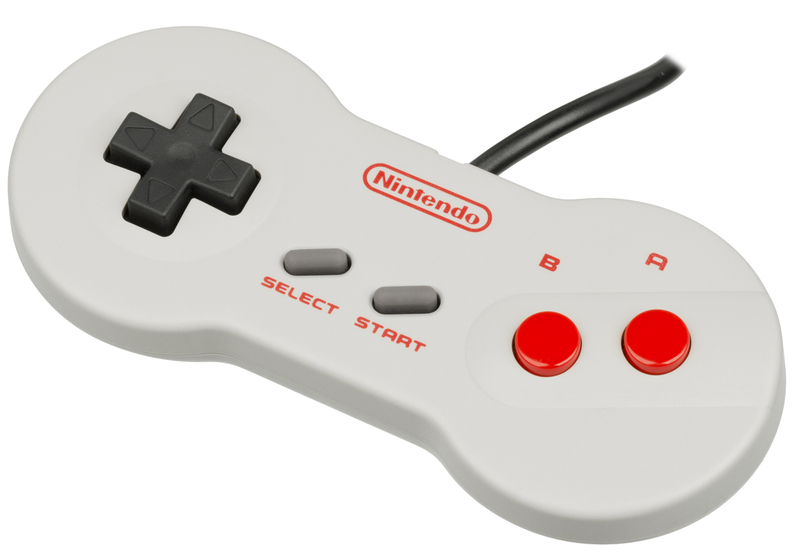 The classic NES controller is a simple thing. Rectangular in shape, these were the days when designing a contoured controller built for human hands was not in the cards yet (SEGA would get that started with the Genesis). Still it is a small controller and easy to hold. You’ve got a D-pad, a Select and Start button and then two action buttons, A & B. I always found it odd that the B button is first (going left to right). These guys are pretty sturdy and hold up pretty well. But like any controller that is decades old you will find some that don’t work. 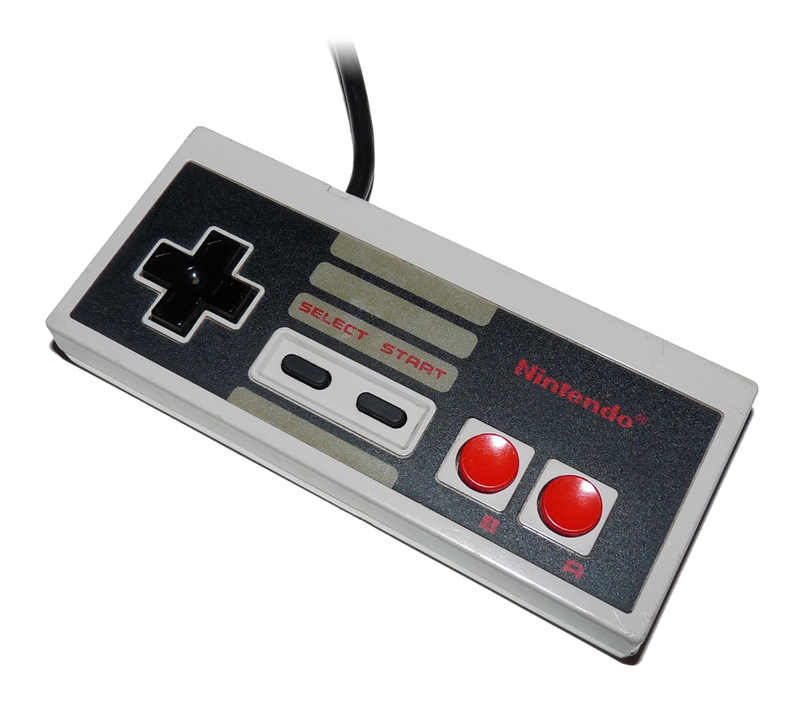 This slick little controller was packed with the NES 2. It is often called the Dog Bone controller because it’s made from actual dog bone! I kid. Having the corners hacked off from the original controllers does make this one more comfortable to hold over time. 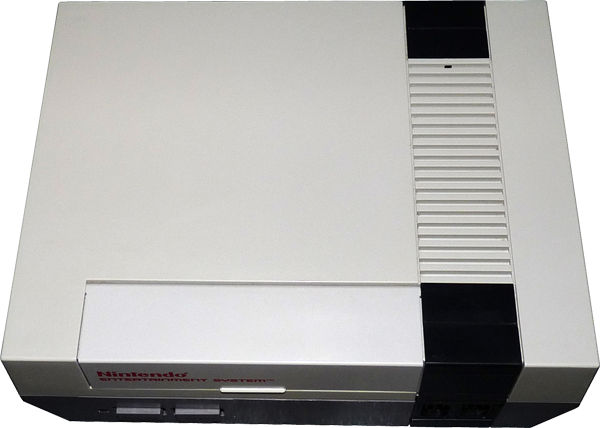 It functions just like the original and you can use it on the original NES. 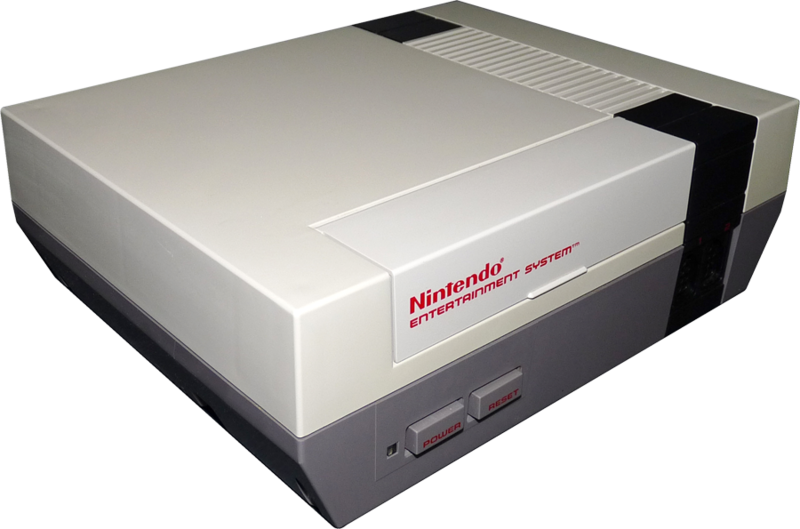 The Nintendo Entertainment System originally shipped with Mario Bros. & Duck Hunt. Duck Hunt required the Nintendo Zapper Gun! This came packed-in with every NES system. A great gun, with one trigger, has a nice feel and was accurate. As with all of these light guns from the classic systems, they do not work with new flat screen TVs. These guys will only work with CRT Tube TVs as they shoot electrons that only a CRT can register. This is a great reason alone to keep an old-school tube TV for your gameroom. The NES had a great selection of gun games so this is a peripheral you definitely want! Almost any Nintendo game you like on the current Nintendo system probably got its start on the NES. Mario Bros., Zelda, Metroid, Final Fantasy and many more all got their start on this console. The NES’s massive library has something for everyone. 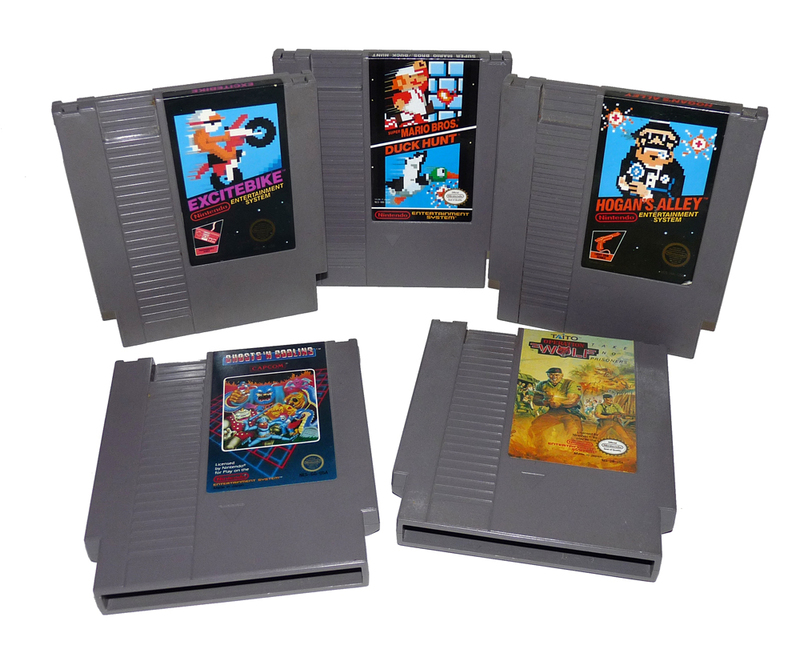 The most awesome platformers, arcade classics like Pac-Man, Frogger & Donkey Kong, RPGs, Run and Guns, SHUMUPS, you name it, you can find it on the NES. So get one! 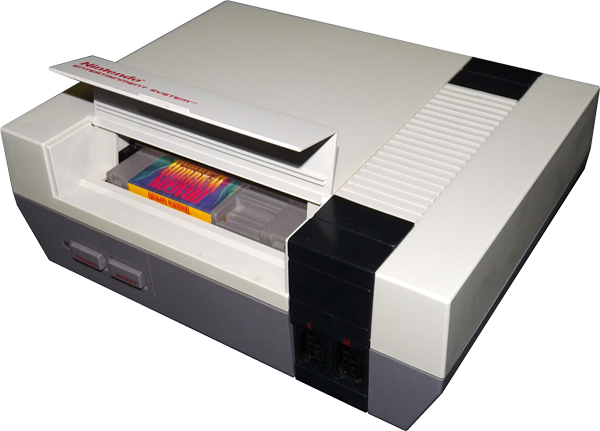 The NES is a cartridge based system. The large grey cartridges are sturdy and hold up well over time. The games shipped in cardboard boxes, which like all classic systems that used cardboed boxes makes them a little harder to find complete. You will see many more cart only games, but you can find them boxed with the manual still thanks to the quality kids who took care of them back in the day! The box is slightly larger than the cart itself. The game also came with a nice plastic sleeve to keep your carts clean and dust free. The manuals are often in color and are nice. All games had to be licenced with Nintendo to be released for the NES and Nintendo’s approval was stamped on every box with an Official Nintendo Seal of Quality. 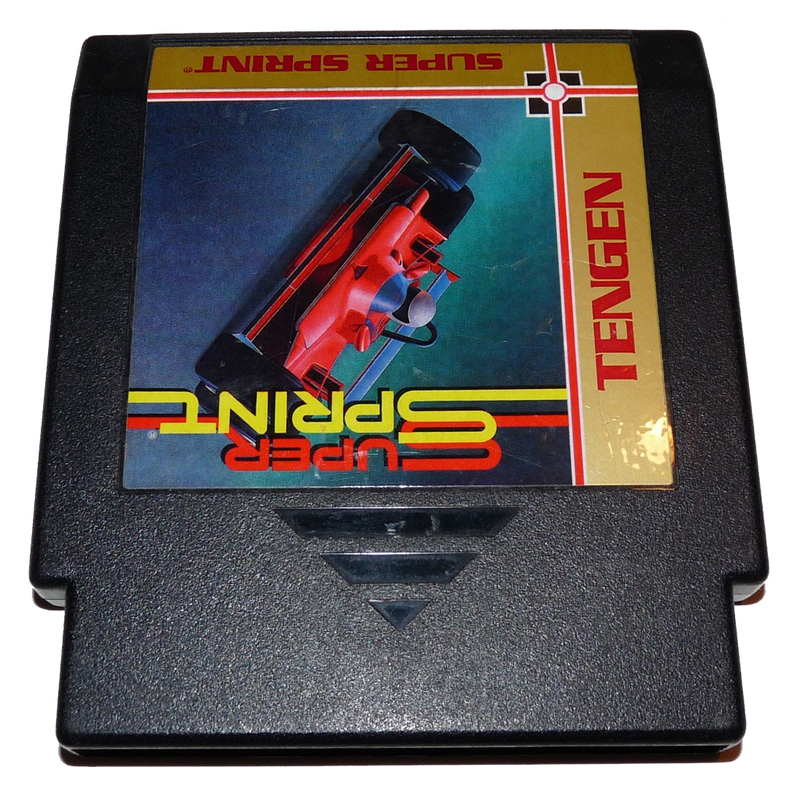 Some companies like Tengen skipped this process and got into some trouble. Many of these games can be found in two releases, those with the seal and those without. A review of Ninja Gaiden for the NES. A game I never played back in the day, this fantastic action platform game will test your will like no other.